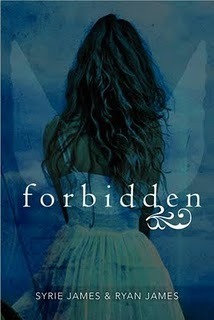 Syrie joined forces with her talented son Ryan to co-write her next novel, Forbidden. The book is about a 16-year-old girl who comes into unusual powers, only to discover that she's half-angel... and her entire existence is forbidden. Their love is forbidden, going against everything Alec has been taught to believe. But when the threat to Claire's life becomes clear, how far will Alec go to protect her? This book immediately caught my eye because I thought the cover was just beautiful; and when I also found out that it was co-written by Syrie James (who also wrote Dracula, My Love, which I loved!! ), I couldn't help but move this book to the top of my list. The story focuses around a teenager named Claire who begins having psychic visions of the future - but has no clue why. She will soon find out that she is a half-angel and that her very existence is considered highly dangerous by other angels out there. Meanwhile, Alec is an Angel who has decided he wants to try and be human for a little while, and he just so happens to choose Claire's high school to do so. He and Claire end up falling in love - but their relationship is strictly forbidden and it's likely that they'll both be killed for it. I really enjoyed this book. I loved that the book was written from both Claire's and Alec's points of view. It made the book read even faster and there were very little parts that lagged behind. The action and fighting in the story were great and I totally imagined this book as a movie because of it. The one down side I would have to say about this book is that it was predictable. It was obvious who would be the bad guy and I wish that the authors would've taken the time to throw in a few more surprises. All in all, though, it was a great read, and I'd recommend it to everyone!! LET ME KNOW WHAT YOU THINK ABOUT THIS BOOK!! I really enjoyed NOCTURNE so I hope I'll like this as well. Thanks for the review. Forbidden romances and angel books rarely catch my interest (I don't think many of them are done very well), but this one sounds fantastic, and the fact that you rated it so highly only makes me want to read it more. I love the cover as well. Thank you so much for this review! I wasn't sure if this book would interest me but it sounds like it would be good. I'm glad you said it has some action and fighting in it--big plus for me ;) I think I'll give this one a go. Thanks for the review! Ooh this sounds good! I love alternating POVS!